Registrations for this event are currently closed as we have reached full capacity. Thank you for your interest. The VET Development 2018 PD Calendar will be launched soon, check out their website in the coming weeks www.vdc.edu.au. As 2017 winds up, it is really important that Trainers and Assessors start planning their continuing professional development (PD) for the year ahead (2018) as VET practitioners. As part of the Registration Standards, an RTO must ensure that all trainers and assessors undertake PD in the fields of the knowledge and practice of vocational training, learning and assessment, including competency-based training and assessment. In this webinar we will explore what VET PD is, what forms of VET PD could be acceptable, how to quantify VET PD and explore some examples of best practice. Participants will also receive a complimentary 2018 VDC PD Planner. 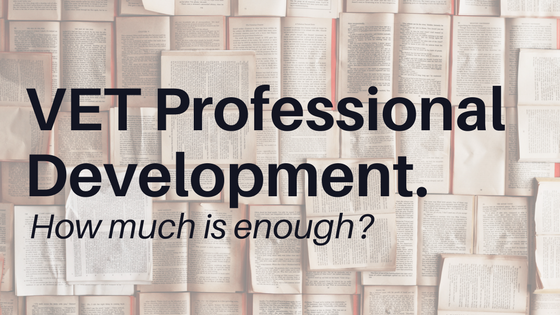 • Insight into what they should do in the lead up to 2018 in planning their Professional Development.